Do you want your home to feel clean and organized? Do you wish your friends and relatives could see you as the woman who has “it all together?” If you do, I’m going to share my secrets for how I keep the house clean all week long. 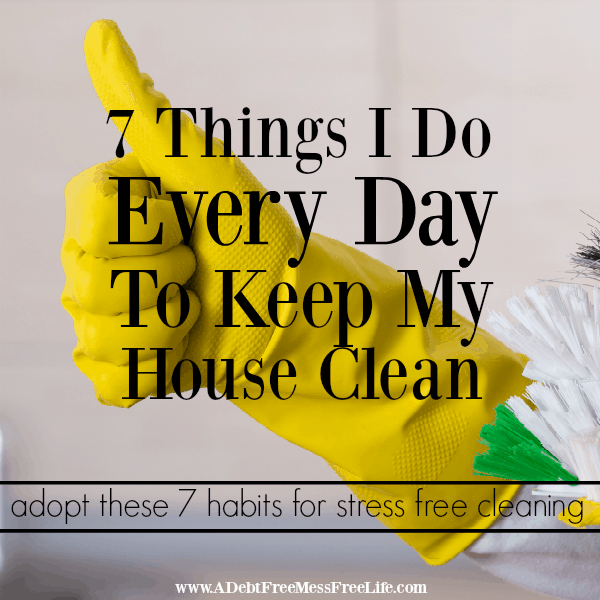 Keep reading to learn the seven things I do every day to keep my house looking fantastic. First, if your house needs a really good deep down cleaning initiating these tasks will help, but won’t transform your house thoroughly. What you might want to consider doing is holding off and working on getting your home up to speed. My Rescue Your Messy Home Challenge will probably go a long way in getting your home to look like the home you always dreamed of. The program walks you through 14 days of cleaning and organizing tasks that I know will reveal your perfect house. Once you’ve completed the challenge, come back and do these seven daily tasks to maintain your beautiful home! Cleaning and organizing take time. It won’t happen overnight, not unless you refrain from sleeping for days and spend all your waking hours getting the house up to speed. And, since that’s not a reasonable expectation, focus instead on progress. Each day realize you’re working towards the overall goal of getting the house in order and congratulate yourself for the accomplishments you’ve made. For your home to be at a place where you’re happy with the cleanliness and organization means you’ve adopted and embraced a set of routines and habits. If you don’t have any, these 7 are a great place to start. Just when you think you’re done, you’re not. Cleaning is an ongoing process. Unless you live alone and never “live” in your home, there will always be something to tidy and clean. If you’re ready to do things a bit differently and maintain the cleanliness of your home on a regular basis, embrace these seven habits starting today. If you’re looking for some great cleaning checklists to help you remember what to do each day, you can find them in my Free Resource Library. Don’t have the code to get in? No problem, just sign up below and you’ll get instant access to all the great printables in the resource library. And, the best part is I add to it all the time! Make your bed each morning, and you’ll be amazed at how great your room will look and how much your attitude will be impacted. Not only will your room look instantly neater, but did you know that an organized environment can positively impact your mental state? Yes, it’s true, and it’s what people who keep their homes clean already knew. In a survey of 68,000 people conducted by Hunch.com, 59 percent of people don’t make their beds, 27 percent do, and 12 percent pay a housekeeper to do it for them. But here are the hard stats: 71 percent of bed makers consider themselves happy; while 62 percent of non-bed-makers admit to being unhappy. Bed makers are also more likely to like their jobs, own a home and feel well rested, whereas non-bed-makers hate their jobs, rent apartments, avoid the gym and wake up tired. Of course, there are happy non-bed-makers out there, but you can’t argue the statistics do point to the benefits. So, making your bed each day and tidying up (we’ll get to that later) makes you feel happier, and have a more positive outlook on life. I want you to look around your house right. Are there clothes and shoes strewn around? Maybe coats on the backs of chairs, clothes on the floor of the bedrooms, perhaps that piece of exercise equipment or chair in the bedroom have become a place to hang your stuff? Nothing makes a house look more cluttered and messy than when clothes are left around and not put in closets and drawers. As someone who has professionally cleaned for over 13 years, I can tell you, clothes and shoes are a significant obstacle to maintaining a clean home. When I take my clothes off or walk in the house, whatever I’m wearing is either put away or put in the laundry. I don’t throw them over a chair or throw them on the floor. All my clothes have a place, and they go there at the end of the day without exception. It takes less time to do this each night than it does to run around looking for the other match to a pair of socks or your favorite jeans. Same goes for when I use something. Laundry – the dreaded laundry. I have done my fair share of laundry. When my mother became ill six years ago, she also became incontinent and liked to rip off her Depends each night. Some weeks I did upwards of 20 loads of laundry in a week’s time. So how did I manage it all? By doing laundry every single day. I know, probably NOT what you wanted to hear, but bear with me and hear me out on this. The whole idea behind these 7 habits is to do small, but significant, tasks regularly so you never get overwhelmed with clutter and cleaning tasks. If you ignore the laundry all week, it will take you hours upon hours to get it all done. If you save it up for the weekend, is that how you want to spend hours of your time on a Saturday or Sunday? People who maintain a clean and organized home have something in common. They know where to find things. When they need a stapler, they go to their office or workstation. When they need a measuring cup, they know they can find it in the kitchen cabinet next to the stove. They don’t have to waste time running around the house looking for items because they’re right where they left them. I want you to think back to the last time you went looking for something and couldn’t find it. Were you frustrated? Maybe angry? Did you have to rush out and re-purchase something you knew you already had if you could only put your fingers on it? Disorganization wastes time and money and causes stress and frustration. Implement this habit, and you’ll find life gets a whole lot easier. Your kitchen is one of the most utilized rooms in your home. It gets a lot of traffic, not only from members of your family but from others who visit and like to congregate in that space. Kitchens can also be a breeding ground for germs, so it’s an important room in the house to keep clean and presentable. Dishes seem to be a significant problem in most households, although I’m not sure why with more than 75% of households owning a dishwasher. But I think I might know the answer from all the houses I’ve cleaned over the years. You see, the problem lies in the family’s ability to keep the cycle of dirty and clean dishes moving in and out of the dishwasher. What ends up happening? Dirty dishes get piled in the sink and on the countertops. Because the kitchen is the centerpiece of most homes, it’s essential to maintain it daily. This means not only doing dishes every day but clearing and wiping down the table, sweeping crumbs off the floor, wiping down the counters, stove and other appliances that might need it and keeping your sink clean. If you’ve ever walked into someone’s kitchen that was less than clean, and they offered you a glass of water, you know what I mean when I say the first thing running through most people’s head is “eww, no thank you.” You don’t want to be that family. When mail comes in handle it immediately. Throw away junk mail as soon as you’ve scanned it and realized its lack of importance. File bills or put in the office or wherever you pay your bills so they don’t get lost. Same goes for newspapers and magazines. Purge regularly and rid your self of paper clutter before it begins. I know many of you are going to be scratching your head and wondering why on earth you need to embrace this habit. You want a clean and orderly home, right? This habit supports that goal because it asks you to clean up after yourself each time you make a little mess. This habit asks the family to be mindful of the person who needs to use the bathroom, kitchen counter, or other space. It requires that we keep the space clean and orderly, so our mess doesn’t become someone else’s mess. By working together as a family, your home can get clean and stay clean and tidy all day long. Adopt these seven simple habits and see if it doesn’t make a difference in your home. What are the things you do daily to keep your home clean? I’d love to hear what you do daily to maintain your home! Let me know!